In Alaska, getting there is half the fun! Flying to Alaska, from the Pacific Northwest, West Coast, Midwest, Rocky Mountains, East Coast, Germany, Japan or even China on direct, non-stop flights is the most common way to get here from there. Below you'll find links to the most common air carriers with non-stop flights from major cities including: Seattle, Portland, San Francisco, Los Angeles, Salt Lake City, Minneapolis, Chicago, New York, Frankfurt, Tokyo, and Taipei. Of course, connecting flights with as little as one stop are available from countless cities. Flight times to Anchorage aren't as far as you might think, just 3 hours from Seattle, 5 hours from Los Angeles, 5 hours from Minneapolis, 10 hours from Frankfurt and 7 hours from Tokyo. As you approach the Anchorage airport, you'll fly right over Prince William Sound, near the ports of Whittier and Seward on the northern Kenai Peninsula, as you float over glacier-capped mountain after mountain with views of the ocean and incredible wilderness. 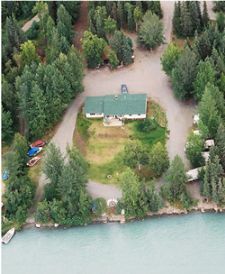 After landing in Anchorage, you can travel to Kenai Riverfront on the Kenai River in Soldotna by rental car, rental motor home, or shuttle bus, taking from 2.5~3.5 hours or by commuter flight in just 25 minutes. We recommend a rental car, offering great flexibility and the ability to easily stop along the way for photos at the many beautiful vantage points along the highway. For other destinations in Alaska, such as Denali National Park or Fairbanks, you can travel by train on the Alaska Railroad, either by deluxe dome sightseeing service or on the coach class service. Tracks run from Anchorage north through Denali National Park, approximately 8 hours, to Fairbanks, 4 hours past Denali. You can also take the train south past Alyeska Ski Resort in the Girdwood Valley to the port of Whittier just 1.5 hours south of Anchorage, or the port of Seward, about 2.5 hours further. Water options in Alaska, aboard the Alaska Marine Highway System are plentiful as well. High speed and standard speed ferry service, with staterooms optional, is available throughout Southcentral Alaska, connecting the ports of Prince William Sound, Kachemak Bay, and Kodiak Island; as well longer distance trips in Southeast Alaska connecting Washington State with the ports of the Alaska panhandle--Ketchikan, Juneau, Sitka, and Skagway/Haines. Travelling to the Kenai River in Soldotna, Alaska is easy! Below are some of the travel options with flights, rental cars, train, cruise ship and Alaska Marine Highway Ferry that we would recommend. Flying time from Seattle to Anchorage is just over 3 hours. They also serve the entire west coast, Arizona, Washington D.C., New York, Miami, Orlando, Mexico and now Hawaii! JetBlue Airways recently announced non-stop flights from its hub, Long Beach, CA, beginning in May. Alaska Airlines offers non-stop service from Anchorage to Seattle, Portland, San Francisco, Los Angeles, Denver, Chicago, Honolulu and Kahului (Maui). Delta Air Lines flies year-round, non-stop flights from Anchorage to Minneapolis-St. Paul and Salt Lake City. During the summer, routes from Atlanta and Detroit are also available. Continental Airlines travels between Anchorage and Seattle all year and adds a route from Houston-Bush International Airport during peak season. US Airways has non-stop service between Anchorage and Phoenix year-round from Philadelphia in the Summer. Frontier Airlines will fly non-stop daily between Denver and Anchorage beginning in May. Sun Country Airlines travels non-stop between Anchorage and Minneapolis from May to September. Condor Airlines (a subsidiary of Lufthansa) operates charter flights at least once per week from early May to early October. The flight route is between Frankfurt & Anchorage, and the flight lasts approximately 10 hours. Round trip tickets can be found during the early and late season for as little as $500~$600 if you're lucky! Edelweiss Airlines, based in Switzerland, recently announced weekly service between Anchorage and Zurich. The return flight makes a stop in Whitehorse, Yukon, Canada. JAL operates charter flights in the summer to Anchorage, and in the late winter/spring they operate the famous Aurora Borealis charters from Tokyo's Narita airport to Fairbanks, Alaska. China Airlines operates flights between Anchorage and Taipei. Flying to the Kenai Peninsula from Anchorage?